"A culture is like a whole tree: you have to water the roots to keep the tree alive, but at the same time you can't go cutting off the branches every time it tries to grow." Now, you can vote for your favorite European Cajun & Zydeco -musicians, -band & -cd. Check out the link to place your vote. The award will happen during the Cajun & Zydeco festival in Raamsdonkveer, Holland. A Cajun-cd from Big Sandy coming soon??? Seems like rockabilly- & western swing-star Big Sandy enjoys my cajun accordion… Wouldn't it be great if he, with that wonderful voice he has, should make his Fly Rite Boys warm to do some Cajun-recordings? This picture has been taken by our dear friends Andy (from the U.K.) and Aneta (from Poland) during a jam session-party in a chalet at the Rockabilly Rave, earlier this year. A Texan walked into the City Bar last weekend and started bragging that nobody could drink like Texans can and bet that if any of the Cajuns there could drink a whole case of beer in an hour or less he would pay them $100.00. Boudreaux got up and walked out. A little while later Boudreaux came back inside and asked the Texan if his offer was still good. The Texan said that it was, and he would, in fact, even pay for the beer. Boudreaux told the bartender to line em up, and made short order of the case of beer, finishing in well less than the hour. The totally amazed Texan held up his part of the deal and paid the $100.00. But he was a little curious and asked Boudreaux, "By the way, when I made the offer, you left. Where did you go?" Boudreaux answered him, "Mais I went to de other bar across de street. I had to make sure I could do it!" Sady Courville and Dennis McGee : "La Vieille Musique Acadienne"
At the end of the '20s, when the first cajun recordings were made, these guys were already well-known. On this Swallow Records-cd (2003), you'll find the last recording session that these 2 related fiddlers, Dennis McGee and Sady Courville, made together. These '70s tracks were recorded at the Swallow recording studio and came out on LP in 1977. You'll enjoy 12 tracks of pre-accordion cajun style by these legendary fiddlers. Next to Dennis McGee on first fiddle & vocals and Sady Courville on second fiddle, Wallace "Frere" Lafleur plays guitar (& vocals). Sady Courville died in 1988 and the next year Dennis McGee also died. 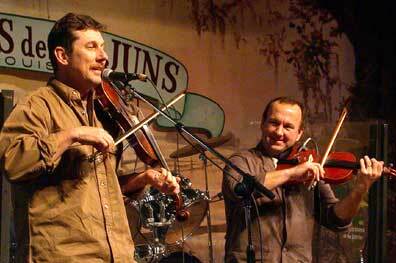 They both played traditional Cajun music for over 60 years. Capitain, capitain, voyage ton flag! Next Mardi Gras is on tuesday (of course!) 8th February 2005. Still early to talk about it, but maybe a good moment for making plans... Lots of great concerts going on in Cajun Country, around that time. On this link you already find a great programm for 2nd till 11th February 2005. Book your flight, grab your mask and let's Mardi Gras! Hans den Boer has deceased at the age of 46. Hans was well known as a great man with a big Cajun heart. 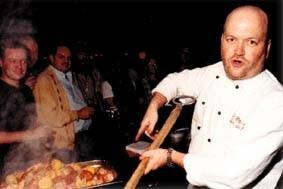 He also was a great Cajun cook who took lessons in Louisiana. At the yearly Cajun & Zydeco-festival in Raamsdonkveer everyone was queuing to taste his delicious Cajun meals. He’ll be missed a lot! My condolences go to his family and all his friends. Please give your web condolences on the link or say your last farewell at “De Witte Leeuw”, Prins Hendrikstraat 6, Raamsdonksveer on wednesday 21st April at 11.30 a.m. In 1982, Al Berard and some of his friends started a band named after the Basin. Their first album ("Let's Get Cajun"), that came out in 1990 on the Flying Fish label, was already good for a Grammy nomination in the traditional folk category. Only one year later, they had another great album, called "Stayin' Cajun" (featuring Danny Collet on accordion and vocals), on the same label. 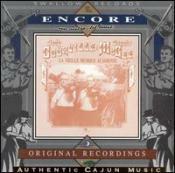 The cd "Dans La Louisiane" came out in 1996. In 2001, they released a cd on their own label, "Old Man Records". The name of the cd is "Deux Violons" (which means "Two Fiddles", played by Al Berard and Faren Serrette) and it has been nominated for a Louisiana Cajun Award as "Recording of the Year" by the Cajun French Music Association. 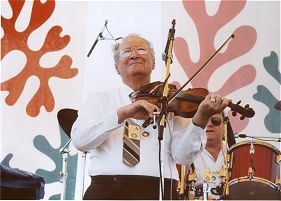 Al Berard was also nominated for the "Fiddler of the Year"-award. As can be heard on the samples on their website, seems like "Two Fiddles" is another jewel from this great cajun-band. Well, I guess it's time for some of you, to learn to dance the cajun two-step... Here it is... Sponsored by Tabasco (the best tomato-soup in the world) !! !